OASW’s Provincial Social Work Conference is the largest knowledge mobilization event for social workers in the province and poster presentations are an integral part of knowledge exchange at this event. At the November 2018 conference, over 25 posters were featured, highlighting innovative clinical interventions, community programs, research and approaches in education, program and policy development, relevant to social work practice. All poster abstracts were evaluated through a double-blind peer review process for acceptance to the conference. During the conference, posters were evaluated by two independent judges and awards were granted to the best poster in the following four categories: Practitioner, Student, Academic-Researcher and Collaborative (representing interdisciplinary authorship). OASW wishes to congratulate all poster authors for their contribution to the 2018 Provincial Social Work Conference and is pleased to announce the 2018 poster award winners by category. The Daytime Support Group is a well-established resource at Mount Sinai Hospital for individuals affected by Inflammatory Bowel Disease (IBD). Co-facilitated by a social worker and nurse, the focus of the Group is to provide an environment that promotes peer support and resource sharing to cope with the ups and downs of IBD. Social workers developed and facilitated an innovative program with inter-professional colleagues to target community-based couples where one partner is caring for their spouse living with dementia. The program combined evidence-based interventions, caregiver support and a participatory arts interventions. 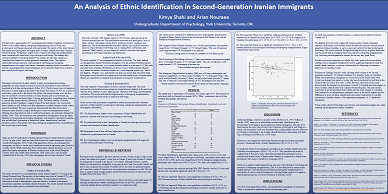 This poster presents the results of a study exploring ethnic identification in second-generation Iranian immigrants living in Canada. Results indicate that higher levels of perceived intragroup marginalization from family, friends, and Iranian community members negatively correlate with psychological well-being. This poster outlines a qualitative study investigating experiences of women attending counselling services for intimate partner violence (IPV). Study implications include recommendations for incorporating intersectional understandings of IPV and trauma into the provision of mental health services for IPV.